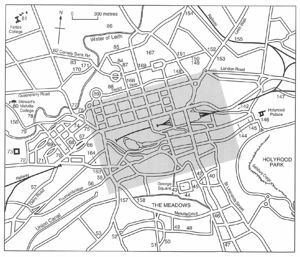 Edinburgh's buildings - location map, inset (Central Edinburgh. Edinburgh's buildings - location map. The Binny Sandstone of the West Lothian Oil-Shale Formation was extensively worked in West Lothian and Midlothian. The completion of the Union Canal in 1822 allowed stone from West Lothian, particularly from Binny and Humbie quarries, to be transported more economically to Edinburgh. This coincided with a declining production of the harder-to-dress Craigleith and Ravelston stone. The canal trade declined with the growth of the railways from 1842 onwards. The Binny Sandstone varies in thickness from about 76 to 152 m and consists of several beds separated by shales. In the Broxburn district it is 107 m thick. The stone is usually grey with rusty tints. At Craigton and White quarries the rock is white. The strata dip 15° to the west. The upper seams of the working bed have a slightly greyish colour, the lower and by far the greater part is of a fine white colour. All the sandstone exposed at present is pale yellowish brown. The sandstone at Binny contained bitumen which gave the rock a freckled appearance and according to Bremner (1869), 'wherever this is most distinctly marked, the stone is most durable'. The bitumen is a hydrocarbon (ozokerite) which appears in joints or cavities. In 1850 Gowans collected some of this material from fissures in the rock at Binny Quarry and made it into black candles which were exhibited at the Great Exhibition in 1851. Gowans also noted that the 'best fakes are saturated with bitumen'. At Binny and Humbie quarries and also Straiton Quarry (east of the Pentlands) the Binny Sandstone contains traces of oil. The stone at Straiton, although otherwise excellent, was stained with crude oil and this was found to mar the surfaces of the dressed stone and eventually led to the abandonment of the quarry. Tait noted that the replacement of water by small amounts of oil in the pores between grains contributed to the durability of the stone. He also mentions the disfigurement of the Scott Monument (3) (1840-46), National Gallery (5) (1850-59) and Royal Scottish Academy (4) (1831-36), by black patches on the surface of the stone, generally attributed to smoke pollution. He stated that 'close inspection of the distribution and shape of sooty patches and bands coupled with the knowledge that the rock does contain oil suggests the conclusion that the darker markings are oily patches to which cling a special thick coating of soot'. By 1845, Binny appears to have superseded Craigleith stone. It was described as 'very nice material, probably not quite so durable as Craigleith but less costly to work and of better colour; for ornamental carving it is particularly good'. At Binny Quarry, freshly worked sandstone was grey but recently cleaned buildings exhibit an orange-coloured stone, e.g. The National Gallery (5), Royal Scottish Academy (4) and Bank of Scotland (13) (1802-06) on the Mound and the Dome Bar (1031 (formerly the Royal Bank of Scotland's 'temple') (1843-47) at 14 George Street. The Royal Scottish Academy also used stone from Craigleith and Cullalo (see below) which contrasts with the orange-brown stone from Binny and Humbie quarries. The stone seen in these buildings is little weathered although there is some scaling on the architrave on the east side of the central portico of the National Gallery. The stone in the latter is very uniform with a polished or lightly stugged finish. A different sandstone has been used for one of the shallow pilasters and in a few other places on the west side. These stones are probably replacements. Two nearby buildings where Binny stone has not been cleaned are the Tolbooth St John's Church (11) (1842-44) and the New College & Assembly Hall (12). Both are heavily grimed but locally there is considerable scaling, for example, on the north side of the Tolbooth Church and around the north entrance to New College where the brownish yellow sandstone is revealed on worn buttresses. A single block of Binny stone, weighing about 20 tons when it left the quarry, was sculpted by John Steell into the Queen Victoria Statue and erected at the Royal Scottish Academy (4) in 1844. Donaldson's School for the Deaf (73) (1841-51), West Coates. Brown tint. At Hermand, West Calder, a 27 m thick sandstone at the same stratigraphical horizon as Binny was formerly quarried. This stone has an overall grey appearance but is characterised by brownish laminations and reddish staining streaks or patches. St Mary's Cathedral School (69) (1885), Palmerston Place. Calton Gaol (134) (1886), Calton Road. Mercat Cross (19) (1885), High Street. Restoration. Great Junction Street tenements nos. 69 & 71 (1884). Royal Overseas League (96) (1879-80), 100 Princes Street. Formerly Windsor Hotel. Humbie Quarry, north of Kirkliston, produced three colours of stone: white, grey and light brown. The sandstone has a freckled appearance in parts. Smith (1835) noted that the stone 'is very little laminated' and is 'almost entirely composed of granular concretions of white and grey translucent quartz, intermixed with scales of white mica and grains of feldspar. The quarry was abandoned by 1868 being unable to compete with other quarries. The white stone was most highly regarded and was used for the front part and portico of Surgeon's Hall (38) (1829-32), Nicolson Street, and for the Robert Burns Monument (142) and Dugald Stewart Monument (137) on Calton Hill. The grey stone was used for dressings of rubble buildings and for stair steps and plats?' According to Bremner, the stone was used in 'street buildings, especially in the Newington district'. Other examples are the Tron Kirk Steeple (25) (1828) which was largely refaced with Darney stone in 1974-76 and the newer work for the Royal Scottish Academy (4) (1831-36). The quarry is situated between Winchburgh and Philpstoun and was opened up in the Binny Sandstone. 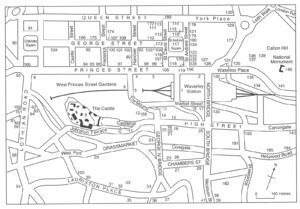 In 1892 the quarry had recently been re-opened and the white stone occurred in a great massive bed with few shaly partings. The stone was used for the additions to Surgeon's Hall (38) (1890), Nicolson Street, and additions to Craigcrook Castle (1891), Craigcrook Road. This page was last modified on 8 November 2015, at 00:13.